I found most of the facts about the Norse Gods interesting. Most interesting things I quite enjoy, but this book makes the Norse Gods look like insane teenagers. They do acts which I would never even think about doing. In the end of this I rather be on the sides of the Giants, because they at least have manners. At one part a god decided it would be smart to put his hand in a killer wolfs mouth. Most of the gods are greedy and they hire basically another god to do all their dirty work. Frey (another god) now I think is just dumb at some parts. Frey gives his almighty sword to guy who faces his crush to tell her, he loves her. Very good companion to the first book. Debunks some of the Viking myths, and contains a good amount of historical information. I would highly recommend this for readers at the middle school level. Also very good for students with an interest in history and/or mythology, not just readers of the Magnus Chase books. great book conceived and written specifically for young adult readers, this enjoyable and informative educational companion offers an in-depth look into some of the exciting stories and characters of Norse mythology. Creation of the world and how its the first people were created. a good introduction and starting point for more serious study of Norse myths. Would recommend to young and older readers new to Norse mythology. thanks for the free read from goodreads. I received a copy of this book of free through Goodreads Giveaway. 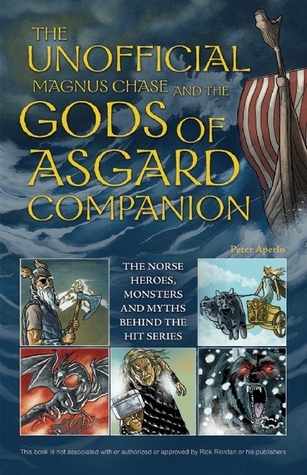 I found this book very detailed in Norse mythology and helps explain a lot to better understand the series. Unfortunately there were way too many typos and missing words in the text.